One thing that is interesting about director Alexander Payne is that almost all of his films are set in Nebraska. Who knows why that is, but setting this story in Nebraska makes a lot of sense as Payne really captures the ordinary, vanilla mundaneness of rural America through his direction. What better place to capture ordinary, rural America than the state of Nebraska? Even though I actually have never been there, to be fair. Nebraska is about a geriatric man named Woody Grant (Bruce Dern) suffering from dementia who got a letter saying that we won a million dollars. However, his son David (Will Forte) thinks the prize is a scam, along with his ornery mother Kate (June Squibb). David then goes on a road trip with his father so he can live out his fantasy. First off, I loved the brilliant direction from Alexander Payne. He films the movie entirely in black and white, and that definitely sets the tone for the film, as Payne is showcasing the bleakness of rural, small-town America. Yet ironically, the film has such an offbeat colorful story. It is a comedy-drama that portrays a man with dementia and does it without being overly depressing or having too many light-hearted moments. This is definitely better than a film that came out last year about the hardships of growing old. (*cough* Amour *cough* An overrated French film that won Best Foreign Film at the Oscars last year) Plus, there was a scene that took place at a karaoke bar and that made me pretty giddy since I usually go to karaoke. I also really liked the performances from the cast. While Bruce Dern really shines in the lead role, in my opinion, it is Will Forte that makes the film. Forte, who is usually a comedic actor famous for SNL, does a complete 180 and gives a performance of quiet subtlety in this and I love those types of dramatic performances. Comedy may be Will's "Forte" (pun intended), and he's great at it, but I'd definitely love to see him do more dramas as well as comedies. Not only does Forte make the film, but June Squibb almost steals it. June Squibb is great as the flustered cranky wife who serves as comic relief. Some of the crazy stuff she says will have you in stitches. I'm not going to lie, I did have one minor complaint about the film. I thought it was a little too drawn out and a little longer than it needed to be. Luckily, it didn't stop me from enjoying the film, and I really did. Other than that, I really have no other complaints about the film. 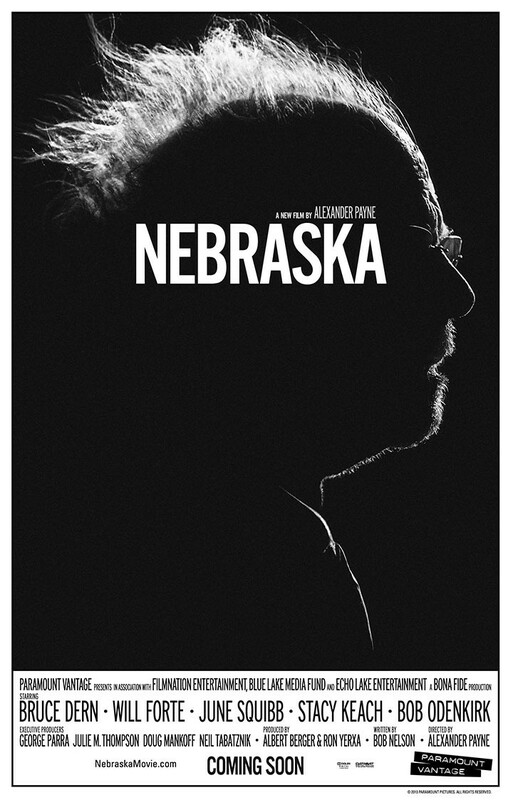 Overall, Nebraska is a brilliantly directed and well-acted comedy that carries nuanced, underlying drama. It not only captures the bleak realities of rural small-town America, but the spirit of independent film, as it shows with a small cast and a good idea, you can make a masterpiece. I would definitely recommend this to anyone who likes to study film and anyone that is a fan of indies, or anyone else that just likes to watch movies. This film is a real treat.